Pixel Whisk: "Peaches Come in a Can..."
"Peaches Come in a Can..."
On a recent visit to one of the nicer restaurants in Westchester, I ordered the "fresh" blueberry & peach crisp. "Fabulous!" I thought. 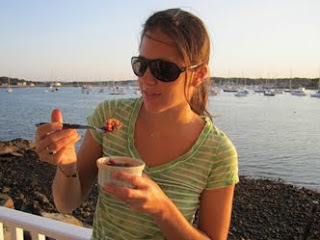 How can they go wrong with such a deliciously simple dessert? When my crisp arrived at the table, I immediately noticed that my peaches were not fresh as advertised. They were canned and rubbery. 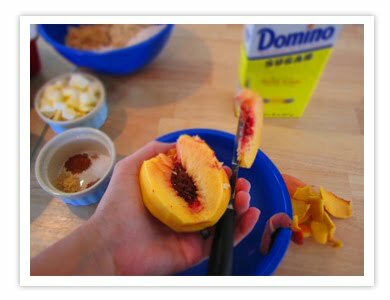 Why used canned peaches when they are finally in season and available! So today I am going to post how incredibly easy it is to make a crisp. This is possibly one of the best dessert options when you want something quick, easy and seasonal. 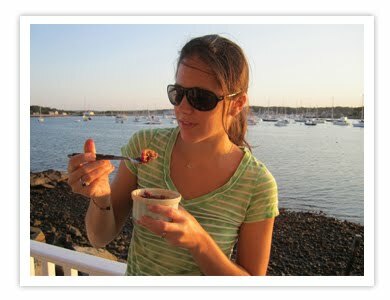 It's also one of the few desserts that is perfect for every season. In the Fall you can make a traditional apple crisp. In Winter, a hearty cranberry & pear crisp. 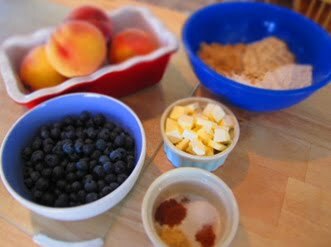 Spring boasts strawberries and rhubarb, and since it is Summer, today I will make a blueberry & peach crisp (without canned peaches). This crisp recipe will serve 10-12 people. In a medium sized bowl, combine the flour, sugars, oats, almonds, cinnamon, nutmeg, ginger, salt and cubed butter. (Wash your hands and prepare to get messy!) 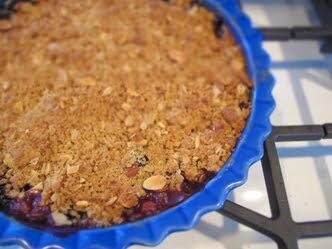 Use your hands to incorporate all the ingredients until you have a coarse crumble. You can also get the same result if you own a food processor. 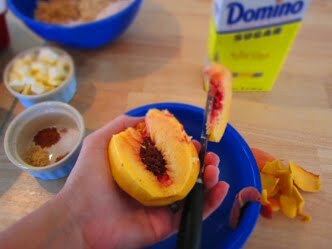 Peel and slice peaches into a large bowl. 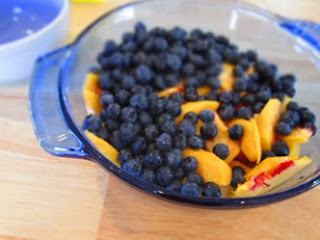 Add blueberries and mix in cornstarch. Butter any baking dish that fits your fancy. I chose a pie dish, but a loaf pan, or even 10 small ramekins could work. 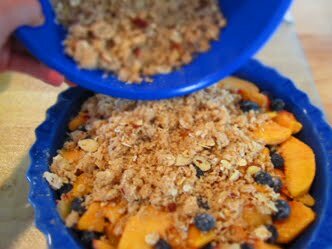 Pour blueberry/peach mix into buttered dish and top with crumble. Bake for an hour at 325 degrees, or until the filling is bubbly and topping is golden brown. Serve warm and even top it with a giant scoop of vanilla ice cream! 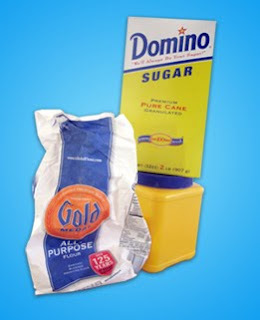 I couldn't help but take a snapshot of all the beautiful packaging for my baking ingredients. Perhaps it's because many of these companies haven't "modernized" their historic labels, but there is some really beautiful packaging out there in the baking aisle. And if you really need to see some beautiful label graphics, check out Jamie Oliver's new Pantry Collection at Williams Sonoma, The Jme Pantry Collection.